Did you know that seafood on the WWF-SASSI red list are red because they are either from unstable populations, have extreme environmental concerns, lack of appropriate management or are illegal to buy or sell in South Africa? Not all red listed seafood are illegal, but some are, and these are either specially protected – not allowed to be taken out of the ocean at all- or recreational ‘no sale’ species that can be caught by recreational fishers with a permit and adhering to catch limits. Some specially protected species are brindle bass, seventy-four and potato bass and recreational no sale species are East coast rock lobster (KZN), white musselcracker and bronze bream. 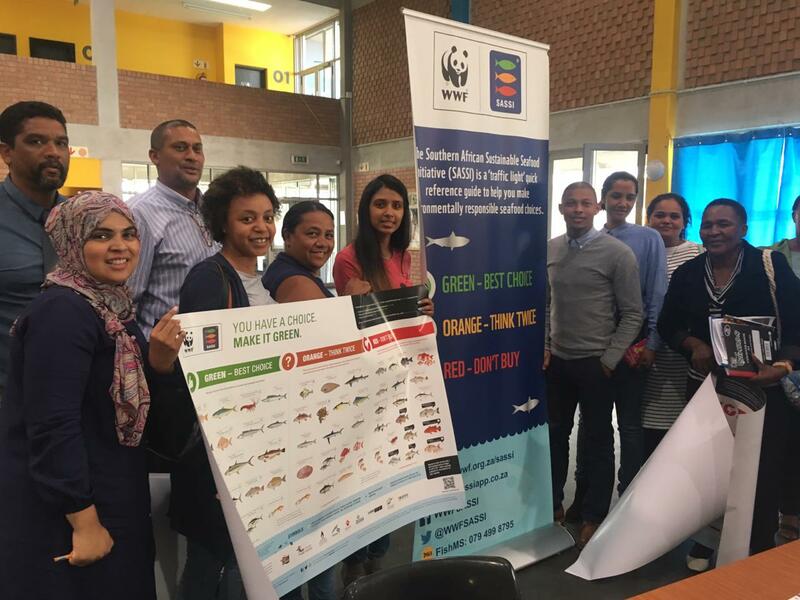 In April 2019 WWF issued a media release urging consumers to scrutinise seafood menus closely to ensure that they are not being served fish that are red-listed by WWF-SASSI. Green-listed fish are a consumer’s best choice as these species are fished at ecologically sustainable levels and can handle current fishing pressure. Orange-listed species are of some concern and caution should be exercised when purchasing and/or eating these. Red-listed species should be avoided at all costs because there are major conservation concerns. How is this list compiled? The WWF-SASSI list is a snap-shot in time of the ecological sustainable status of a species, and listings are based on a thorough and in-depth review of all available data and publications. One example of a red-listed fish that is finding its way onto high-end restaurant menus is that of red stumpnose – also known as Miss Lucy. From a WWF-SASSI perspective, this is not an ecologically sustainable choice. While this is a popular eating fish it is extremely vulnerable to fishing pressure. Some of the characteristics that put this species at risk are that it is a resident, reef-based fish with a long-lifespan (specimens of 50 years have been recorded) and consequently late maturing. While red stumpnose is endemic to South Africa, occurring only between Cape Point and East London, it is already commercially extinct in places like False Bay, and now only forms a very small component of total linefish catches, highlighting its low level of abundance. There is also no effective management plan in place to improve the stock status of this iconic species. From a WWF-SASSI perspective, this fish should never be served in a restaurant no matter how or where it is caught. Did you know that squid have three hearts? Or that female sardines can produce 200 000 eggs a season? And that rock lobsters moult 11 times before they are fully grown? These are just a few of the fun facts contained in our new activity book featuring a downloadable pack of cards to teach kids more about fish and sustainable seafood. 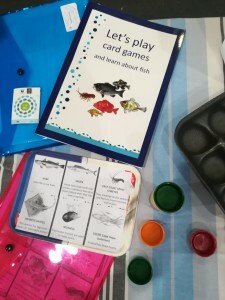 The book – titled “Let’s play card games and learn about fish” – is the work of WWF-SASSI with the support of the UN One Planet network. This exciting creation should be used in conjunction with the free WWF-SASSI app which is regularly updated with information about the sustainable seafood list. Teachers and parents are encouraged to download the book for free, and to cut out and laminate the brightly coloured fish cards for use in the classroom or at home. It contains ideas for more than 15 games and activities for kids from grades 4 to 10 and synchronises with the school curriculum.The cards are small enough to fit into a handbag, picnic basket or rucksack and are adaptable to any age group. There are also templates for those who wish to expand on the pack by creating their own cards. We have tested these cards and facilitated training with our networking partners including aquariums, environmental educators, Table Mountain and West Coast National Parks staff and school teachers and everyone it has been great fun! It’s a great way to introduce kids to the idea of sustainable seafood and how they can contribute to taking care of our oceans. One of the activities for older kids is to encourage them to look at menus from seafood restaurants and test where they are on the sustainability list using the WWF-SASSI tools. You’ll be amazed at what you find! In 2018 WWF-SA released an updated ocean economy scorecard on the state of the country’s marine resources which was launched amidst the enchanting exhibitions at the Two Oceans Aquarium, for key players in the industry. The first of Oceans Facts and Future report was published in 2016 and its objective was to provide a snapshot of the state of our oceans and to catalyse collaboration. Within the report, an ocean economy scorecard was developed to act as a marker against which progress could be measured and tracked. Two years later, this scorecard has been updated to see if there have been any significant changes. Globally, there has been a 2% increase in overfished stock and a 4% drop in under-fished stock, which indicates that more and more species are being fished to capacity and beyond. In South Africa, the number of sustainably fished species (optimally exploited) remains the same. WWF-SASSI species assessments have increased from 79 to 91, largely due to an increase in the number of assessments for inshore trawl bycatch species. The total number of orange-listed species in the WWF-SASSI traffic-light system has increased. Some species, such as carpenter and panga (inshore demersal trawl), have shown an improvement and consequently have moved from red to orange. Others, like sardine (purse seine) and gurnard (offshore demersal trawl), have shown a decline and thus moved from green to orange. African penguins and West Coast rock lobster numbers continue to decline at an alarming rate. For penguins, this is due to a lack of available food and the effects of climate change. The decline in rock lobster is being driven by high levels of illegal, unreported and unregulated fishing (IUU) and poor management of the fishery. There have also been positive changes with regards to coastal livelihoods in that small-scale fishing communities have been identified with the first allocations being made in the Northern Cape. Similarly there has been a positive shift with regards to marine spatial planning with planning legislation now being implemented. Major retailers and suppliers continue to make steady progress against their commitments. 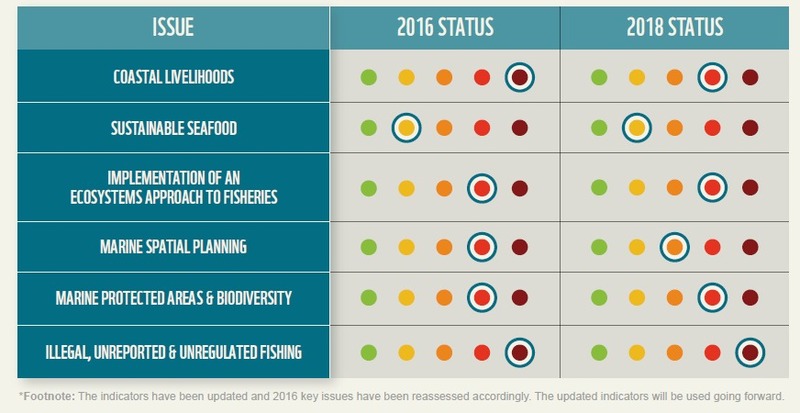 While it is encouraging that many of the key challenges and issues highlighted in the 2018 scorecard have not shown any major regression, the overall picture is concerning and significant progress still needs to be made going forward if we are to safeguard our marine resources for coastal communities and future generations. Eight new South African chefs have been awarded WWF-SASSI Trailblazer status for their commitment to the use of sustainable seafood! 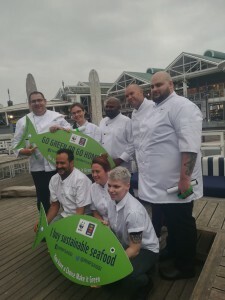 The annual WWF-SASSI Trailblazer Awards 2018 was held in October 2018 at Harbour House at the V&A Waterfront, recognised and celebrated chefs who actively champion sustainable seafood practices in their restaurants. Chefs serve as the gatekeepers for the food and hospitality industry and so play a critical role in leading market forces, influencing popular taste and promoting ocean-friendly seafood. Our partnership with them is inspired by a commitment to help restore our overexploited seafood species. The chefs we recognise have gone the extra mile in advocating the sustainability message. The chefs were chosen on the basis of: The restaurant’s seafood sustainability policy; the effectiveness of their communication of their seafood sustainability practices to their customers, employees and suppliers; their level of engagement in communicating their seafood sustainability practices to a wider audience; and, the ‘Trailblazer factor’ (those chefs and restaurants that are going the extra mile in promoting and supporting seafood sustainability). Congratulations to all the Trailblazers! The Federated Hospitality Association of Southern Africa (FEDHASA) recently challenged members to kick unsustainable practices to the curb through a fast-paced cook-off in partnership with WWF-SASSI. It’s hoped that through this cook-off, the industry will be more sustainable and creative in their use of seafood, and will spread the word to consumers. Chefs play a key role in transforming the food and hospitality industries to become more sustainable. Being sustainable and particularly making informed choices around the seafood they serve not only makes good environmental sense but also good business sense. Chefs are key to driving change, they can create wonderful sustainable and delicious seafood dishes that inspire and create awareness. 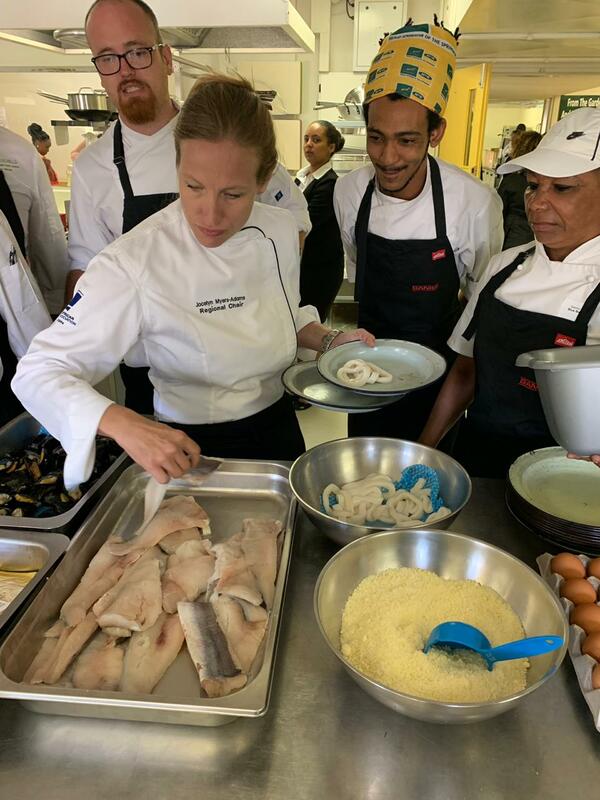 25 chefs participated in the exciting cook-off in March 2019, which was held at the Cape Town Hotel School in Granger Bay. The chefs were given 45 minutes to create a dish using sustainable seafood from the WWF-SASSI green list. The cook-off teams were led by executive chefs Rudi Liebenberg of the Belmond Mount Nelson Hotel, Jocelyn Myers-Adams, representing the South African Chefs Association, Shane Louw of Mont Rochelle, Judi Fourie of the Victoria and Alfred Hotel, and Lindsay Venn of Tsogo Sun. Students from the Mitchells Plain School for Culinary Skills were also part of the teams. 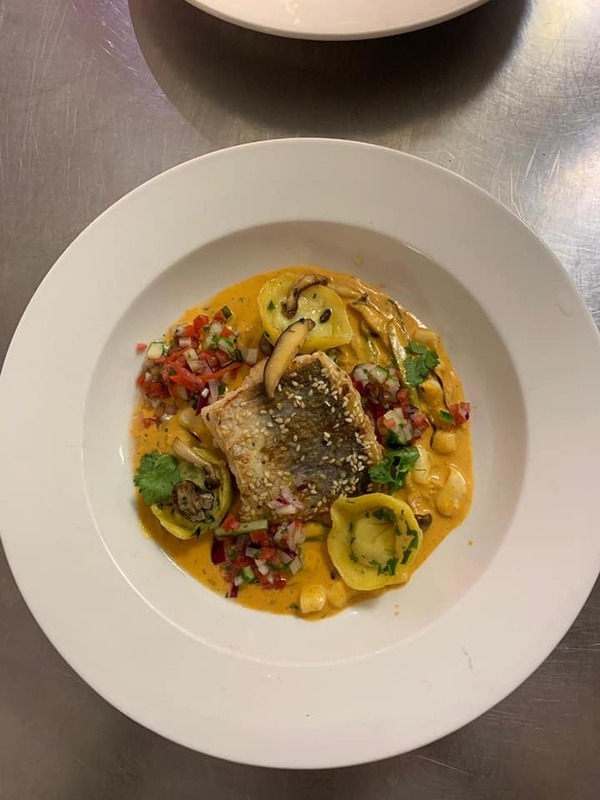 Liebenberg led the winning team, who created a scrumptious dish of pan-fried hake, seafood curry, smoked salmon tortellini and a tomato salsa. Judges on the day were WWF-SASSI ambassador Jason Whitehead, The Vineyard hotel executive chef Carl van Rooyen and FEDHASA CAPE Restaurant segment chairperson and celebrity chef Pete Goffe-Wood and Chef Nadin Pospech from Top Nosh Catering. Van Rooyen shared that fine dining food need not contain fish on the red list and, with a bit of creativity, one can showcase the many exceptional fish species found in South African waters. Initiatives like this FEDHASA cook-off is a fantastic way to highlight our local talent, as well as the sustainable practices that should be embraced in kitchens across the Western Cape. The Western Cape hospitality industry also claims to embrace sustainability and responsible tourism through a range of practices. The cook-off event was just one way to show the contribution towards protecting the Western Cape’s natural beauty and resources, and reducing our impact on the natural environment. All in all it was an exciting event, with delicious, creative food and great networking. A huge thanks to Checkers Food Services for sponsoring the event ingredients and to Banks Kitchen Shop for supplying kitchen appliances that were donated to the Mitchell’s Plain School of Skills after the event. Angling is a popular pastime enjoyed by more than a million people across South Africa on inland dams and at the ocean. But, while the number of recreational fishers has increased substantially over the past century, catch rates have steadily decreased. To reverse this trend, WWF South Africa has partnered with the South African Shark Conservancy (SASC), the Oceanographic Research Institute (ORI), the South African Institute for Aquatic Biodiversity (SAIAB) and Rhodes University to publish A Guide for Responsible Recreational Fishing in South Africa. Sponsored by the WWF Nedbank Green Trust, the guide’s release was timed to coincide with the summer break when many recreational anglers head to the coast for their holidays. The guide covers a wide range of topics, from catch limits and permits to humane catch-and-release methods and how anglers can contribute to our collective knowledge as citizen scientists by recording and sharing their catch information. The guide was launched at the South African Fishing Festival in Johannesburg in November 2018 and WWF is revealing the guide at uShaka Sea World at an event supported by Fish For Life in April 2019. Adheres to regulations. 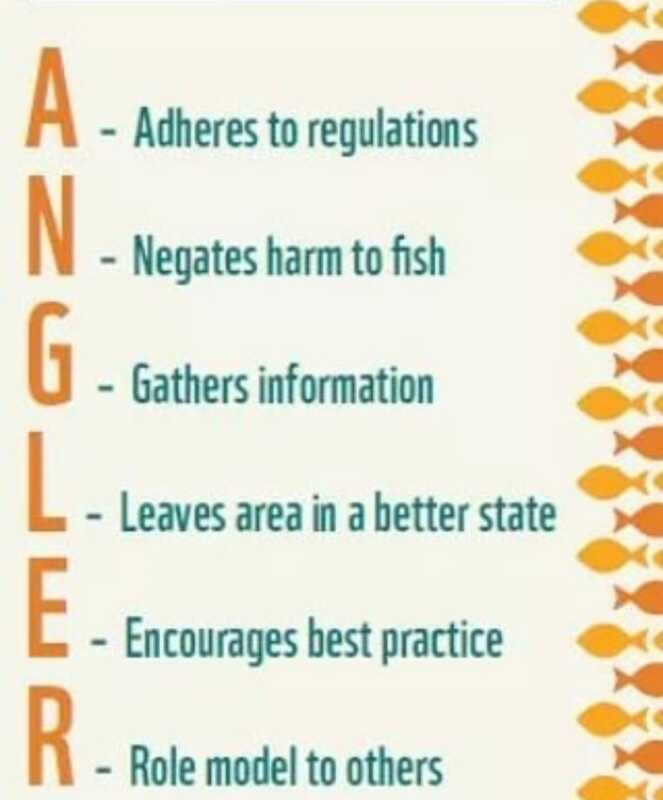 A responsible angler always has a valid recreational angling permit; adheres to regulations; uses legal roads and tracks when accessing fishing areas; and reports illegal activities such as environmental damage and pollution. Negates harm to fish. A responsible angler handles all species in a way that ensures their best chance of survival; quickly and humanely kills retained fish to ensure the least amount of suffering; and uses equipment and tackle that minimise stress and injury to fish. Gathers information. A responsible angler seeks information on the status of marine resources and the impacts of angling on species; embraces recommendations from informed researchers and fishery managers; and records details of their catch. Leaves the area in a better state. A responsible angler disposes of fishing line and plastics appropriately, leaving the environment and fishing area in the same or a better condition than when he or she arrived. Encourages best practice. A responsible angler does not sell fish; collects bait with the minimum disturbance to the environment; and acts responsibly when exposed to activities that will negatively affect the conservation of marine resources. Role model to others. 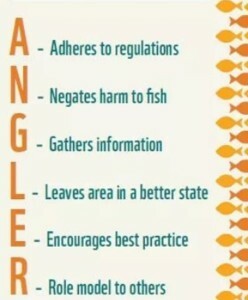 A responsible angler is a role model to other anglers and leads by example; educates others – especially younger anglers – about sustainable fishing practices and is considerate of other legitimate marine users. Have you ever wondered how your seafood gets its SASSI colours? And just as you’ve gotten used to the pocket card, it changes! The WWF-SASSI list is an on-going process, with new species being assessed as required. The WWF-SASSI seafood database, assessments, and tools are regularly updated using the “Common Wild Capture Fishery Methodology”. In order to ensure that the methodology is up to date and globally applicable, it is updated from time to time by fisheries scientists, the North Sea Foundation and WWF fisheries experts from Africa, Asia, Europe and the United States. This methodology is considered best practice for consumer seafood guides and is transparent and consistent across borders. The Common Wild Capture Fishery Methodology scores a species across three categories, namely (1) stock status, (2) ecological impacts of the fishery in which the species is caught, and (3) the management measures in place for that particular fishery. The aquaculture methodology scores a species across four categories, namely (1) regional production system (and siting), (2) feed, (3) ecological effects, and (4) management. 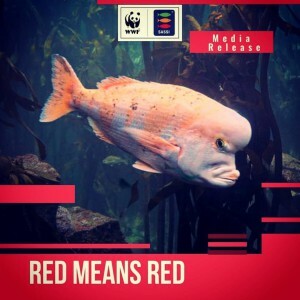 Based on the score received, a species is listed on the WWF-SASSI seafood list as Red, which includes species from unsustainable populations as well as species that are illegal to buy or sell in South Africa; Orange, which includes species or fishing/farming methods that have associated ecological reasons for concern; or Green, which includes species that are the most sustainably managed. WWF-SA undertakes significant efforts to develop the WWF-SASSI assessments through an objective, transparent and collaborative process, where assessments are desktop reviews of available scientific fisheries information. This provides broad-level guidance to consumers and retailers on a particular species per fishing method per country. And there you have it, the science of the SASSI list! Monkfish caught in the offshore trawl fishery has changed from green to orange. All monkfish is therefore orange listed. Natal knifejaw is a brand new species that is listed, as red. Horse mackerel has been newly assessed for inshore trawl and is orange listed. White-spotted smooth-hound shark is a new species that has been assessed for inshore trawl and is red listed. Common smooth hound shark remains red. Cape hope squid has been newly assessed for inshore trawl which is orange, whilst jigging remains green. Bigeye tuna caught by pelagic longline is red listed from the Atlantic Ocean and orange listed from the Indian Ocean (in South Africa only). Jacopever has been newly assessed for the inshore trawl fishery and is red listed. Herring caught via midwater trawl in the following fishing areas (FAO 27: *ICES VIa, ICES VIIb, ICES VIIc) has shifted from orange to green. Sprat caught via midwater trawl in the following fishing areas (FAO 27: ICES 22-32) has moved from orange to green. *ICES areas stand for International Council for Exploration for Seas who assign codes to various fishing regions which enables tracking of fish stocks and management of these. Globally, it is estimated that about 30% of seafood sold to the public in restaurants or retailers is mislabelled or misrepresented. A recent local study found that 18% of seafood samples in South Africa were incorrectly described in terms of species! This is a marginal improvement on a previous similar study, and it is still evident that there is a need for greater transparency in the market. Transparency is the power of anyone to be able to see of where a product has come from. How was it caught/ farmed? A common example of the murkiness in the market is the multitude of different species being referred to by one common name, or many common names used for one species. Cape Dory gets referred to as John Dory (these are two different species); Salmon Trout (a name was made up by mixing two different species – Atlantic salmon and rainbow trout); Seabass (there are many different species that this could be); Haddock is just smoked hake in South Africa; and a big one is prawns (this could be so many different species, from different areas and harvested in different ways). All WWF-SASSI Retailer/ Supplier Participants are working to include adequate labelling on their products. This should create a norm and those that are not including adequate labelling will increasingly be at a disadvantage, therefore ultimately eliminating mislabelling from the South African seafood market. In light of the current global and local mislabelling trends, the World Wide Fund for Nature (WWF) in collaboration with partners from across the seafood supply chain, has sought to undertake a 6-year journey to develop South African National Standard 1647: “Approved market names for South African fish and related seafood species” (SANS1647). The process began in 2012 when WWF engaged representatives from the commercial fishing sector, small-scale fishing sector, seafood importer and exporters, retailers, restaurants, consumers as well participants from regulatory bodies: Department of Agriculture, Forestry and Fisheries (DAFF), the Department of Health, the SABS and the National Regulator for Compulsory Specifications (NRCS), to initiate discussions on how best to address mislabelling on the local market. After a number of roundtables, an application was submitted to the South African Bureau of Standards (SABS) to develop a national standard and in June 2018 this standard was published. SANS1647 seeks to provide the least amount of market names for more than 700 species traded locally in order to reduce consumer confusion due to the use of several fanciful seafood names. The standard applies to all forms of fish, including fresh, frozen and canned, and can be used by all seafood outlets or businesses and not only those that are consumer facing. The publication of this list will provide clarity on the appropriate set of market names for all species traded on our markets and thereby reduce instances of mislabelling. This list will also increase the application of consumer rights as consumers can confidently purchase seafood with the assurance that they are purchasing what is represented on the packaging. Furthermore, the list will benefit consumer awareness programmes such as WWF-SASSI as redlisted or illegal species can no longer be mispresented as more sustainable options. WWF is currently engaging with its partners in the WWF-SASSI Retailer Participant Scheme in order to adopt this voluntary standard and incorporate it in their labelling commitments. WWF will then look to engage with the broader seafood market to lobby for the large-scale adoption of the standard.